What is Squarespace? Why Choose Donna Halme Designs as a Squarespace Website Designer? Squarespace is a website design platform that is used by Donna Halme Designs and many other website designers all over the world to create customized Squarespace websites for their client’s businesses. For starters, Squarespace is, no doubt about it, one of the rising stars in the world of DIY website building. Recently named #8 as one of Forbes Cloud 100 Companies (private tech cloud-based companies to watch), the platform is as user friendly as web design gets. Owner Anthony Casalena, developed Squarespace as a blog-hosting service while attending the University of Maryland. He founded it as a company in 2003, and was its only employee until 2007, when it reached $1 million in revenue. The company grew from 30 employees in 2010 to 550 by 2015. By 2014, it raised a total of $78.5 million in venture capital; added e-commerce tools, domain name services, and analytics. Squarespace has purchased Super Bowl advertising spots in 2014, 2015, 2016, 2017 and 2018. Its 2017 ad won an Emmy Award for Outstanding Commercial. In 2017, it signed a sponsorship deal with the New York Knicks to add the Squarespace logo to their uniforms. The 24/7 customer care team at Squarespace is available seven days a week, 24-hours a day, and has won several awards for outstanding customer support. Every Squarespace website is equipped with all the elements needed for a strong SEO strategy. Site descriptions, page titles, custom URL’s, search-friendly formatting, and other key elements are all easily managed. Furthermore, there is an automatically generated built-in sitemap that helps Google to crawl, understand, and ultimately, rank a website. There is nothing worse than investing time and money into something you are proud of to watch it collect dust. Many Squarespace webs designers are educated specifically in website design and, in some cases, know very little about Search Engine Marketing (SEM) or Search Engine Optimization (SEO). Donna Halme Designs, however, does go that extra mile. If SEO is important to you a Squarespace web designer that knows their stuff when it comes to search engine marketing and optimization is the right fit for you. Squarespace is built with all the modern SEO standards in mind, however, you still have to know what information to put where. 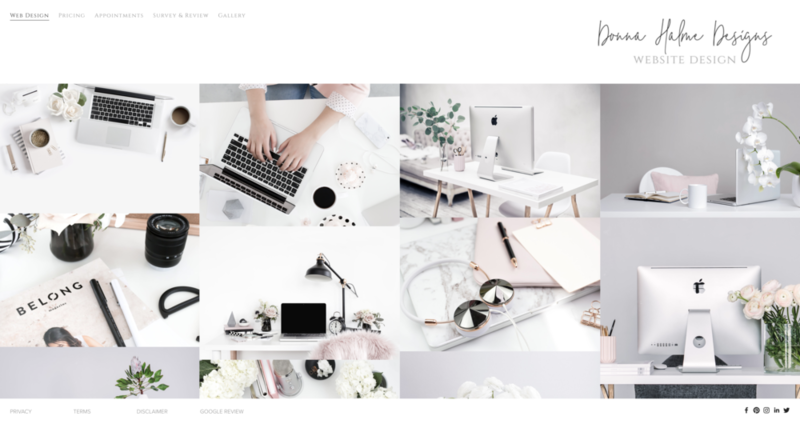 Squarespace was designed for everyone from bloggers to musicians to online retailers, so your clients can be confident that it is robust and flexible enough to grow with them. For more information about Squarespace. Why Choose a Squarespace Website Designer? You may be wondering, why choose a Squarespace website designer? Well, websites are an investment and hiring a Squarespace website designer to create the website you truly want will save you time and stress while also helping grow your business. It will also help get your beautiful new website seen online through knowledge of search engine optimization through Google and Bing. The other reason is it will save you time, as anyone can throw together a templated website in a matter of minutes. Not many people are satisfied with the basics though. They want more but they don’t realize it until they are staring at blank website they just signed up for. It allows you to avoid a “cookie cutter” template design. Nobody wants to be that guy that has a website we have all seen a million times before. with DIY (Do It Yourself) websites, people often find they don’t have the time or knowledge to customize their template and make it truly unique. Any business hoping to stand out from the competition will know the importance of being original and unique, online and offline. Squarespace web designers know how to utilize HTML and CSS to create truly unique website on Squarespace that maintain all the great, easily modifiable elements of the platform itself. Whether it is that fancy feature you see on another company’s website, animated scrolling, or that cool thing where the logo moves, all of these tweaks will take time to research, practice, and implement for a non-developer. A Squarespace expert can deliver the site you really wanted in a fraction of the time. Also when you invest in a website, it should pay for itself by helping you achieve your goals; whether those goals are to drive traffic, collect leads, or raise brand awareness. I simply love what I do! My experience with Squarespace and web design comes second nature to me. I have worked with many private sector businesses as well as the public sector including the Langley School District, and WorkBC Sources Employment Services Centre either updating or creating new website designs. One of the major benefits to working with me is the time my clients will save thanks to my experience with Squarespace and knowledge of website best practices. I’m also a Squarespace Circle Member which provides me discounts and savings that I can pass onto my clients. Donna Halme Designs offers website design, updates, and maintenance packages and services to those interested in having a Squarespace website designed. If you are a client of mine, having a Squarespace website will be simple for you to use on your own once launched. If you are technically inclined plus decide that you would like to maintain and update your website on your own… go for it! After launch I provide a training session and video tutorials to get you started. Remember, as my client, I’m always here for you to answer any questions or concerns. Squarespace offers 24/7 free support either by email or video chat. In addition, there are numerous videos and written information to help you as well if you have any specific questions. I hope you have found this information helpful and if you have any questions, or require further information, you are always welcome to contact me: info@donnahalmedesigns.com or 604-488-9539. If you would like to schedule a Free Web Design Consultation to receive a Web Design Proposal & Scope of Work or an Updates & Maintenance Estimate for your project, please fill out my Website Design Inquiry & Intake Form or check out my website donnahalmedesigns.com. I encourage you to comment on my blogs or I welcome you to subscribe to my blog. The way we are marketing our businesses is continually evolving. In order to keep moving forward, we need to know what our options are and what best suits our individual business marketing strategies. As a business, you know having a website that is search engine optimized and has accelerated mobile pages is a given but there are so many other integrations and marketing tools that you may need to consider in the future. AI capabilities will most definitely be strong in the marketing world in 2019 which is presently powering customer segmentation. This is the practice of dividing a customer base into groups of individuals that are similar in specific ways relevant to marketing, such as age, gender, interests and spending habits. How you incorporate AI into your digital marketing portfolio depends on your business goals and channels. What AI can help with is to improve your customer service experience and provides the ability to improve your existing products and services. The best way to do this is through personalization of each lead and turn them into a marketing qualified lead to a sales qualified lead. There are well known benefits to AI for businesses but very few are currently using it but there are way you can become more AI powered and that is using high quality images and labeled accordingly. It goes without saying, there is a great importance with how we interact with others and having our voice be heard. Social media has been a very popular medium to do this but it is not the only answer to become closer with your customers. One way to do this is to install a chatbot on your website to interact with your visitors on their terms. It proves to be less expensive than having a customer service representative and can answer visitor questions very quickly. Moving into the future, consumers are becoming more sophisticated than ever in finding information through different channels. It provides a better experience for your potential customers because it provides a fluid and consistent communication process for them across all channels. With search engines driving a tremendous amount of traffic, especially Google which accounts for 60% of its traffic coming from mobile devices. As a website’s load time increases, its bounce rate increases that my negatively lead to a lower Google ranking. With the need for speed, Google initiated the AMP project and pages load in less than 0.5 seconds creating a lower bounce rate for your page which is a positive sign. If we go back to the early 2000’s email was done differently than it is being done in 2019. The difference is personalization and makes your emailing more effective. The best way to start is to nurture a lead by using a client relationship management tool. Using video online with platforms such as Netflix, YouTube, Amazon Prime Video, Facebook Live is a big trend and will continue to grow. The reason being is that it’s authentic, less expensive, and activates out fear of missing out. There are two ways to apply live videos for your business, the first is to host an industry event and the second is to have a product launch. These can be optimized on your website by a web designer. Having potential customers try out your products before buying will become a powerful marketing tool. This can eliminate some of the risk of buying products for the first time. It will ensure there is a no-risk factor on your customer’s part and proves that you are a visionary and these types of experiences are becoming more popular. Augmented Reality allows those to add an item into an environment to see how it will look when placed. Virtual Reality creates a whole new environment those can experience as used in games but businesses can use for marketing purposes. These don’t look like ads and in many cases, are mistaken as normal content on a page if it is not labeled as an ad. The way these ads are used is on social media where users are most receptive. Amazon is a major player with native advertising. These types of ads are expected to grow very fast. The best way to market your products is to show your potential customers how your current customers are using it. There are two main advantages to this first, it convinces potential customers and second, it is free! Real life events where individuals can network, celebrate, and hang out together will drive digital marketing efforts. There is a rise in spending more marketing dollars on Adwords in 2019 than you did in 2018. This search advertising revenue has been on the rise and will continue into the foreseeable future. If done right, the money you spend on Adwords, will become provide a great return on investment in the coming year. In moving forward with these trends in mind, there are so many ways to attract more customers to your business and satisfy them. With having said that, social media and Google change their algorithms constantly so there will always be a marketing curve and the future use of AI will definitely change marketing in the future. Okay… you have a beautiful new business website and no one is looking at it… Why? Your new website may have just launched and you are wondering why it is taking time to get traffic to it. The reason for the delay, is that when a website is first launched by your web designer and they have submitted a sitemap (info about pages, video, files on your website and the connection between them) to Google and Bing, it does take time to become fully indexed by these search engines. Keep in mind, no matter how good your site is, these search engines, need time to find it and build a trust in the quality of your site’s content. Choose a few social media platforms that work best for your business. If you are choosing Facebook for instance, you will need to create a Facebook Page for your business and not a personal one. Linkedin is good for B2B (business-to-business) which is the exchange of products, services or information between businesses and their companies rather than between business and their customers or clients. If your business is a creative one, Instagram or Pinterest are best. Remember, once you create and setup your pages you will still need to post and share at least three times per week, build an audience, and engage with your followers on a daily basis. This is a great way to write about your business, your products or services but more importantly, to write your posts about information relevant to your industry and your readers. Every post should include images, videos, graphs, charts, and links to further reading. Think high quality posts for better traffic to site. I highly recommend connecting an RSS feed to your blog so that those who subscribe, will receive notification that you have a new blog post. Ask your friends and family to share your website content and blog posts. These social shares help with your Google ranking and by doing this, it draws attention to a new audience that requires your services or products. If your present website is looking rather outdated, it is worth investing the time and money into having a new website designed. You will find, ROI (return on investment) and that the time, energy, and money spent here is worth every penny. Having a home page that is not complicated and simple for your visitors, will prevent them from wandering away. Your website needs to get straight to the point and prevent them from wasting their time. Ensure that your website is easy to navigate by your visitors on any device they choose from desktops to tablets to smartphones. Keep your site legible and prevent visitors from having to pinch, zoom, and scroll to see your content. Optimized with responsive design allows your site to adjust to the format of any mobile device or browser. Responsive design resizes your content and images to fit different devices and screen widths. It is important to keep your site mobile-friendly as well to ensure your site appears in high-density and Retina display-ready. This creates a lightweight version of your web pages to help load them quicker on mobile devices. AMP works with Google to prioritize results in mobile searches and results appear as “Top Stories” in Google with thumbnail images and headlines. Visitors can click a result to view the AMP version of your page. This helps potential visitors quickly find your blog posts and optimize their mobile experience. It is important to optimize your website for search engines and the content writing you use on your site will make a big difference in how easily potential visitors are able to easily find you. It is important to include keywords on your site that are similar to the search terms those use to find sites like your business. Donna Halme Designs Website Has a Whole New Look! I have been redesigning and updating the content of my website to make it more informative to my clients and visitors. I hope you like it and let me know what you think! If you own a domain you may have received a letter from a company called iDNS Canada. iDNS Canada is a company also known as Internet Domain Name Services. iDNS is a company that targets those who have a domain name registered. This company is hoping you do not completely understand the domain registration service by sending letters in the mail about your expiring domain and requests payment. This scam is very similar to the one that went around in 2014 by the Domain Registry of Canada (DROC). Real domain registration providers will never send you a letter in the mail. Report any letters you receive to ICANN (Internet Corporation for Assigned Names and Numbers). ICANN was formed in 1998. It is a not-for-profit partnership of people from all over the world dedicated to keeping the Internet secure, stable and interoperable. Report all letters you receive for all domains to the Canadian Spam Reporting Centre. iDNS will not be the first, or last company to try and do this. If you are ever unsure about something, always ask your web provider first. Remember, if you are a Donna Halme Designs client, and I manage your domain, you will never lose it. So, be rest assured, sit back and relax because I will always have your best interests at heart. This is Domain Name Expiration Notice I received last year from iDNS Canada… just throw it away! Google and the many ways they can help businesses get noticed. There are many services Google offers which are a great source for business websites. Some are free and some are not but there are ones that can be used to gain insight into what is working and what is not as well as ones that help to optimize your website. Well, this will help gain customer insights across your channels. You can turn insights into action and get stronger results across all sites, apps, and offlne channels. Google Analytics Solutions offer marketing analytics products for businesses of all sizes to better understand their customers. You can test, adapt, personalize. Discover the most engaging customer experiences with Google Optimize. You will be able to test different variations of your website and then tailor it to deliver a personalized experience that works best for each customer and for your business. It enables you to stand out on Google Search and Maps with your free business listing by attracting new customers with your free Google listing. This is a must for any business today as it really helps when visitors search online as your listing appears right when people are searching for your business or businesses like yours on Google Search or Maps. Google My Business makes it easy to create and update your listing—so you can stand out, and bring customers in. Enables you to upload your product data and let millions of shoppers see your online and in-store inventory. Edit it whenever you want, so shoppers always see the right information in your ads. This is a tool that helps you upload your store, brand and product data and make it available to Google Shopping and other Google services. It attracts more potential buyers and reaches consumers while they are actively shopping on Google, YouTube and online. If you are starting a business and would like to have a profession email Get Gmail, Docs, Drive, and Calendar for business. If you are starting a business you need to have professional business email address. By connecting GSuite to your website, and setting up a new GSuite email account it allows you to have your business web address. This enables you to get your ad on Google and be seen by potential customers at the very moment they are searching for what you are offering. It will attract more customers and reach the right people at the right time. Also helps your business get found on searches when visitors are searching for the things that you offer. It lets you advertise locally or globally and targets your ads to customers in certain countries, regions or cities or within a set distance. Let them grow your revenue with ads while you focus on growing your business. All ads are reviewed to ensure they are of the highest quality and relevant to your content or audience, even when viewed on all mobile devices. There are so many other options, depending on what your requirements are for your business but hope this clarifies things a little. New Website Launch of Tanner's Turf! Last week I launched my newest website design for Tanner's Turf! I was contracted to do a website design for a young entrepreneur Tanner Yelland, owner of Tanner's Turf . This design is styled like a magazine, very modern and informative with striking headlines, yet clean, easy to read, and navigate. The site also showcases all the beautiful photos of their completed projects. The main navigation is displayed neatly where, when clicked, I added an emoji of a green seedling for interest to offset the dark background. By creating the Home page with the use of parallax scrolling it provides a visitor the information they are seeking quickly and easily. All social media accounts were added and the Services page displays as an image gallery on a timed slideshow. These images are linked to further information about those particular services offered. As always, images and text show beautifully on all devices by the incorporation of responsive design. I also customized index page titles and url slugs to gain greater search engine optimization for the website. The 'Careers' page has a job description for available positions and a secure link to their employment application form. This was created so potential applicants can add their information, upload their resume, and submit directly to the company. In website design and development, it is always a collaboration between both the designer developer's creative technical ability, and the business owners' knowledge of their industry to design a website that reflects their business, branding, services, and personality. Not only do many hours go into the design development process but the content as well. So a very big "thank you" goes out to all staff who provided their feedback! Web Design Launch of Steveston Glass Ltd. It's official, I just recently launched my newest website design for Steveston Glass Ltd.! I was contracted to do a website redesign for Steveston Glass Ltd. and designed a modern clean look to their site that is easy to navigate and showcases their completed projects. With the incorporation of parallax scrolling and responsive design, images show beautifully on all mobile devices. The Careers page has a secure employment application form which was created so potential applicants can add their information, upload their resume, and submit directly to the company. In website design, it is always a collaboration between both the web designers' creative technical ability, and the business owners' knowledge of their industry, to design a website that reflects their business, branding, services, and personality. Many countless hours go into the design process so a very big "thank you" goes out to all staff who assisted me with their input and vision! It is also a good choice if your primary goal is to display your work or business and you also want to sell products. There are standard web pages that every business website needs. The way the content is presented on the pages may change from site to site, but the pages remain the same. This is your opportunity to provide a summary of who you are and what you offer. You must make this content interesting and engaging, because it needs to grab your visitors’ attention in the first few seconds they are on the page. Do I say about us, or about me, or just about? This is your opportunity to provide an overview of the history of your business and educate your visitor about how you are different from your competitors. Provides information about all of the services you offer. Start the page with a brief overview or summary of your services and then list them below. If you have a large number of services or a lot of information about each service, you may want to think about separating them into categories and including a link to a landing page to learn more about an individual service. Provides information about all of the products you offer. Start the page with a brief overview or summary of your products and then list them below. If you have a large number of products or a lot of information about each product, you may want to think about separating them into categories and including a link to a landing page to learn more about an individual product. This is your opportunity to answer questions that your prospects and customers ask you over and over again, with the idea that the FAQ on the website will serve your visitors better and cut down on the questions you receive. Always pose the questions in a positive fashion and, while you must always answer the questions honestly, you also want to make sure you keep them interested. Your answers should help persuade the visitor to take the next step or action to hire you or purchase your product. Do I need a testimonials page and do I have to call it that? What if I don’t have any testimonials right now? Show your visitors that you are awesome. Testimonials, especially ones that also include a photo and contact info or web address help enhance your credibility, trustworthiness, and your dependability. Testimonials show your prospects that other people have hired your or bought your product and had success and it encourages them to do the same. Provides your site visitors all of the different ways they can get in touch with you. This page is in no way optional. I recommend you also have your contact email and phone number in the footer on every page of your website. This your opportunity to show that you are an expert in your career with helpful advice and links to further reading. It is also a place to speak to the media and the one place it is okay to brag a bit about how cool you are! Your blog is where you can post links to news articles that feature you or your business and press releases about your accomplishments and your business accomplishments. If you create something, this is your opportunity to show it off! This is a must have page for designers, copywriters, photographers, artists, builders, etc., the portfolio page is where you get to show off your work in any way you want and show your visitors what you can do. Did I miss a standard page that should be included in every website design? Is there a page that you feel is important and it needs to be added to this list? Should a page be removed? I would love to hear your opinion! Even if you only had a few page’s worth of information, putting it on a website under yourname.com is still worth it just to have some exposure on the web and make it easier for those hiring or interested in what you have to say. It helps to find you, learn about you, and get in touch with you. More importantly, you have more to fill a website with than you probably realize. The very first thing, when people land on your site, is you want them to understand who you are, what you do, and what you’re looking for. Presently, creative professionals often treat their personal websites as their portfolios, where they collect their work in a way that makes it easy for hiring managers to see their ability. Your personal website isn’t your only marketing on the web as you may have your social media profiles, publications, or places you’ve been interviewed etc. Your site doesn’t need to replace all of these things but an efficient way to bring them all together and make them easier for people to find you. 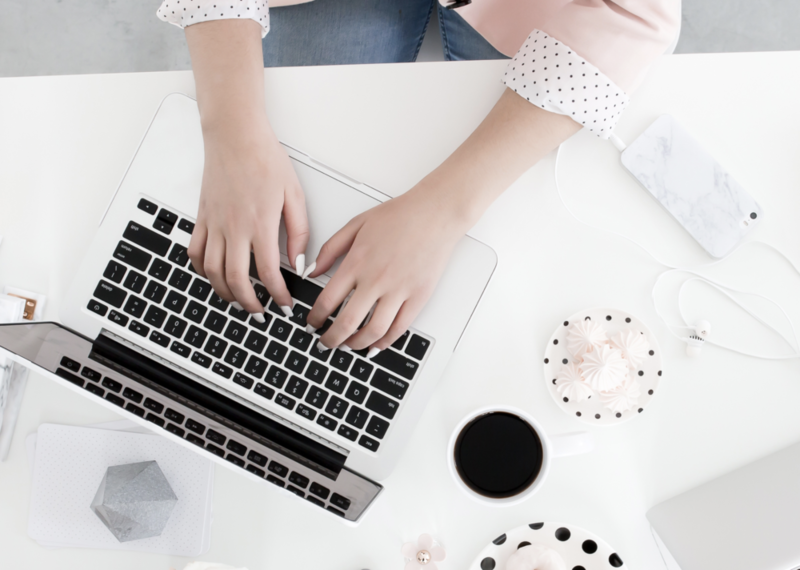 Your personal site is a great place to share your thoughts and philosophies related to your career and having a blog is the perfect way to do just that. It gives you a space to become a thought leader, engage with more people around the web, and the ease to update your network on your career news. In addition, it will show you have great writing skills! Testimonials from people you’ve worked with in the past can be a great way to make you look even more impressive, especially if they are from respected professionals in their career. You can use quotes from people you’ve worked with before to show off soft skills that would be hard to demonstrate, to let someone else praise you so don’t have to, or to simply prove your worth. Finally, it’s important to remember that your personal site shouldn’t just be pages full of text—your resume and cover letter handle that. Instead, find ways to visualize yourself and your accomplishments. You definitely want to tell an engaging story on your site but you are not writing your autobiography here. So keep it short and to the point as people will get much more from a few well written paragraphs to peak their interest. Think of your personal website as a curated gallery of your best work and not everything you’ve ever done. By choosing your best examples, you control exactly what people see. Always avoid sharing any social media profiles that are totally unrelated to your job. This is also true for any blogs that are side projects. If you don’t feel like you can regularly write good, thoughtful content, then skip the blog. It’s not that important for a good personal site, and if somebody comes to your site and notices that your last post is from a few years ago, they’ll assume the whole site stale. Vague testimonials of people saying “she is fabulous!” or “he’s the most wonderful person I ever worked with!” is not only going to sound insincere, it is going to sound a little bit like a brag. In addition, it won’t assist the person reading your site learn anything more about you. Choose your reviewers very carefully, and ask for them to be specific. Do not feel like you have to resort to low-quality clip art graphics as it is better to have none than ones that make your site stand out in a bad light. Consider investing a little money in having someone help you design one or two graphics that will really help you shine, and then keep the rest of the site clean and simple. You have more to say and show off than you ever thought! I hope this information sheds some light on what a personal website should provide to those you are reaching out to. If you are interested in having a personal website designed, please give me a call for a free consultation and estimate. A Professional Website Will Grow Your Business and Help You Stand Out! Sometimes we search for something and find it isn’t even there. It can also be frustrating when it comes to potential clients or customers have issues finding you online is never a great first impression of your business. Research indicates that 91% of people don’t go past the first page of their search results, and over 50% don’t go past the first 5 results! Now that sounds crazy and intimidating, right? Just like most things on the www that information isn’t taken at face value as these search results seem high. The reason being is of the estimated 3.5 billion searches performed every day, many of those searches are Navigation searches which means that those who are searching have a good idea of what they were looking for. They really need something to point them in the right direction. For business, it’s important to get as close to the top as possible. That is something that a professionally designed website with good SEO (Search Engine Optimization) can help you with. Searchers will not always take the first heading, but they will rarely search all the way to the bottom. It may help a little by reaching an audience without a website presence and it's easier to do some marketing on social media and by word of mouth. Going into 2018 your web presence is important when people are looking for small businesses. They want to know that you’re stable, have longevity, and services or products are current. Your website helps customers and clients find you, but a combination of your website and social media allows them to get to know you, find your location, and connect with you. It’s this relationship that will build authority and dedication. Let's face it, we are living in a world that constantly feels the need to be more and more connected to each other and the lives around them. This is a good thing! Now that you have a website, you can blog, provide subscriptions, and connect all your social media accounts! It’s an easy and inexpensive way to keep building that relationship that will continue to grow with every update or click! I really hope this info was helpful, and I would love to hear your thoughts, so leave me a comment below! If you’re a creative entrepreneur, small business, or non-profit and you don’t have a website yet, or you just need a website refresh, I can offer a few different web design solutions, or I can customize one to meet your needs. You can go to my web design services page, or head over to my contact page so I can get started helping you get your professional website. Website, Facebook Page or Both? You have a business or non-profit and created a website, or Facebook page, or both? Both a website and Facebook have specific roles and both are important in building your brand. Consider your individual goals to determine if your website or Facebook is better to reach your audience. Website: It is owned by you and you have complete control over all your media branding. Facebook: Is a third-party site where you follow the company's terms of service that are continually revised and possibly risk your account being deleted. Website: Gives you the ability to design you website to compliment your media branding goals, colours, etc. Further, you are able to customize the design and image. Facebook: You can make minor edits to appearance and add your logo, you don't have creativity with the design. You will also find if there are new designs to Facebook it is after the fact and will show up on your Facebook page. Website: Your audience has to make an effort to come to your site for information and your website has to be successful in order to keep them coming back. With information so readily-available on the Internet, it's a challenge to get people to make that decision to type in your web address instead of another media outlet's. Facebook: You're taking your information directly where your audience is spending their time connecting with friends and family. Your updates pop into their timelines the second they're posted, putting your news right in front of thousands of eyes instantly. Website: Staff has to be trained how to update your website and, in a breaking news situation, the website can sometimes get neglected. This makes your site's content look out of date. Facebook: Even the technology challenged know how to post information, photos or videos on Facebook. In a breaking news situation, you can get quick updates out to your audience as you receive them, which helps your media outlet own the story. Website: Your audience can subscribe to your RSS feed to get that quick delivery of your news. The drawback is, your users have to be using an RSS reader to keep your information streaming into them at all times. Facebook: You can't sell ad space on your Facebook page. The revenue opportunities are non-existent. Website: Your website's statistics are your secret. You don't have to inform your audience how many page views, hits or unique visitors you have coming to your site each month. Facebook: Everyone can see how many fans you have or don't have. As you try to boost your brand using Facebook, you may notice your competitors have thousands of fans while you only have a few hundred. Website: Holding a contest can drive people to your website. You can sell sponsorships, post rules, call for daily entries and monitor your website analytics to see just how effective each contest is for your media outlet. Facebook: Holding a contest solely on your Facebook page can drive your fan base and generate buzz as your contest link is passed around to other Facebook user. You are restricted to Facebook's promotion guidelines. Website: If you allow comments on the stories you post on your website, you have to decide how you'll monitor those comments and develop a policy on how to deal with objectionable material. This can be time-consuming for your staff who may spend a lot of their time policing comments. Facebook: While you still have to keep an eye out for people who are only visiting your page to cause trouble, Facebook does have an easy system in place to block comments and repeat offenders. Website: Your website has limited opportunities to interact with your audience. Even when people are allowed to comment on stories, they typically don't receive a response from a reporter or other member of your staff. Facebook: While users can comment on your stories and share them with their friends, Facebook is a place where you often find journalists using social media to interact with their audience. But is all of that interaction actually helping your media brand? Sure, people can talk about the story they saw on your Facebook page, but if all that buzz isn't driving people to your website, to buy your newspaper or magazine or to watch your newscast, is it really helping your media outlet at all?